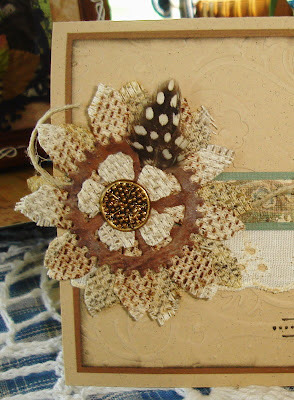 Vada's Blog Stamp Inks and Paper : Counted Cross Stitch Fabric Flower. Thought I would try the “Tattered Floral Die”, today. Found some counted cross stitch fabric and this is what I came up with. Added a sprocket and old button to the center. What a fun little card. Thanks for stopping in, have a wonderful day. I can see clearly now and my eyes are beholding a beauty! Lovely as always, Vada! Sure hope all your blogger problems are long gone! Hugs! Gorgeous!!!! That flower is superior than any that could be purchased and the card .... beautiful. Wonderfully done Vada! That is one gorgeous flower! It's a gorgeous flower and a beautiful card! 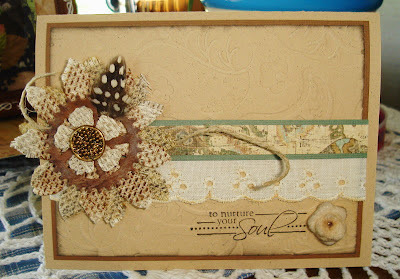 I adore this card the textures are Fabulous!